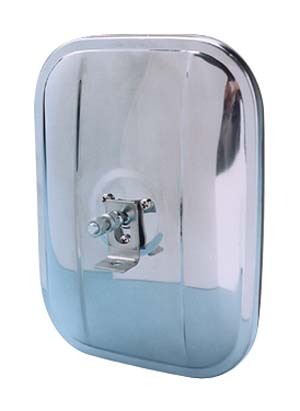 Replacement Head - Stainless "6 X 7.875"
CIPA’s Replacement Mirror Head is a 5 inch by 7 inch stainless steel mirror head with an L-shaped bracket. It replaces the driver side or passenger side mirror head on any original equipment mirror with a 6 by 7.875 inches rectangular mirror head. It features a ball and socket mount, making it fully adjustable and allowing a perfect view of behind every time. Stainless steel finish resists rust and corrosion. Durable steel construction means years of reliability. Actual glass size is 5 3/8 X 7 1/4 . Package includes 1 stainless steel mirror head with glass, 1 L-shaped bracket, 2 lock washers, and 2 nuts. The threaded stud is Course thread, the stud length is 14.59mm and the Diameter of the thread is 5.87mm.